MOVE IN READY SINGLE FAMILY HOME IN ESTABLISHED COMMUNITY OF GRAYSTONE RESERVE. THE "HAWTHORN" IS A VERSATILE PLAN, OFFERING A FRONT LOADING 2 CAR GARAGE. COVERED FRONT PORCH WELCOMES YOU, WITH FOYER & DINING ROOM TO SIDE & GREAT ROOM STRAIGHT AHEAD. LAM. WOOD FLOOR THROUGHOUT 1ST FLOOR. OPEN LAYOUT BETWEEN THE KITCHEN & BREAKFAST NOOK MAKE THIS HOME IS GREAT FOR THOSE WHO LIKE TO ENTERTAIN. KITCHEN WITH 42" CABINETS PAINTED & PAIRED WITH BRUSHED NICKLE HARDWARE, GRANITE COUNTER TOPS AND ENERGY STAR APPLIANCE PACKAGE, INCLUDING GAS RANGE. EXTENDED BREAKFAST BAY OFFERS SLIDING GLASS DOORS THAT LEAD TO REAR COVERED PORCH. THE SECOND FLOOR IS HOME TO 3 BEDS WITH LARGE GAME ROOM. HUGE MASTER SUITE WITH TRAY CEILING, 2 WALK IN CLOSETS. DELUXE MASTER BATH BOASTS DOUBLE BOWL VANITY, SOAKING TUB, SEPARATE SHOWER, AND TOILET ROOM. 2' FAUXWOOD BLINDS & PRIVACY FENCE INCLUDED! ASK ABOUT CLOSING COST ASSISTANCE AVAILABLE WITH USE OF BUILDER'S PREFERRED LENDER! Ready to visit 4006 Ravine Gap? Request a free property tour! 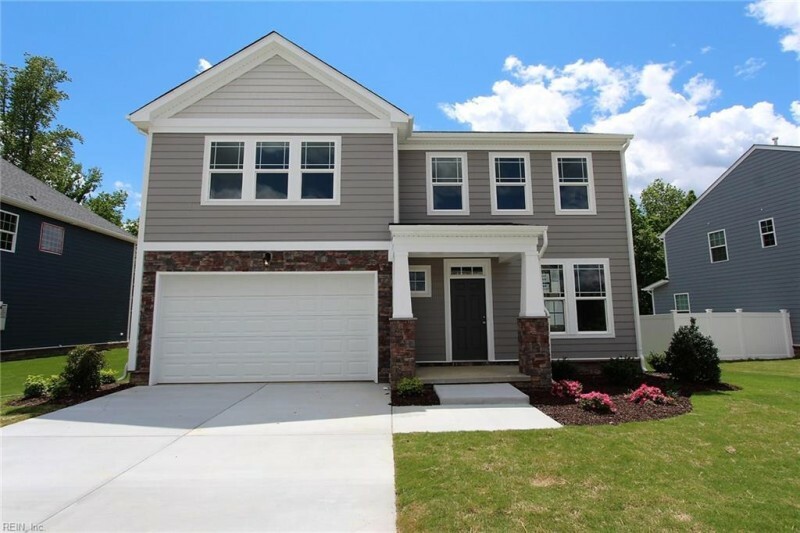 Send me more information about the listing at 4006 Ravine Gap, Suffolk, VA 23434, MLS# 10239123. This 3 bedroom, 3 bathroom home located at 4006 Ravine Gap, Suffolk, VA 23434 has approximately 2,174 square feet. It is currently listed for $314,900 and has a price per sqft of $14,485. This home is currently Under Contract under the MLS#: 10239123. This listing is provided by Today Homes Realty LLC. 4006 Ravine Gap Drive, Suffolk was built in 2017. It has Garage Att 2 Car, 2 Space parking.The kitchen includes Dishwasher, Disposal, Dryer Hookup, Energy Star Appliance(s), Microwave, Range, Washer Hookup. 4006 Ravine Gap is part of the Graystone Reserves neighborhood located in 23434.